Physical activity (PA) is defined as any bodily movement produced by skeletal muscles that requires energy expenditure. Physical activity includes exercise as well as other activities which involve bodily movement and are done as part of playing, working, active transportation, house chores and recreational activities. Physical inactivity (PI) is described as doing no or very little physical activity at work, at home, for transport or during discretionary time and not reaching physical activity guidelines deemed necessary to benefit public health (Bull et al 2004). Sedentary behaviour refers to any waking activity characterised by an energy expenditure ≤ 1.5 metabolic equivalents and a sitting or reclining posture. In general this means that any time a person is sitting or lying down, they are engaging in sedentary behaviour. Common sedentary behaviours include TV viewing, video game playing, computer use (collective termed “screen time”), driving automobiles, and reading. Physical inactivity has a major health effect worldwide. It has been identified as the fourth leading risk factor for global mortality causing an estimated 3.2 million deaths globally. Of the deaths attributable to physical inactivity, 2.6 million are in low- and middle-income countries (LMICs). While physical inactivity is more prevalent in high- and middle-income countries, even in low-income countries it is among the top ten risk factors contributing to death. Physical activity has significant health benefits and contributes to prevent NCDs. Policies to address insufficient physical activity are operational in 56% of WHO Member States. Physical activity helps prevent many major non-communicable diseases (NCDs). Children and adolescents who are physically active have a better chance of being healthy adults. Along with other common risk factors like hypertension, tobacco use and unhealthy diet, physical inactivity is an important factor in the rise of NCDs, which now kill more people around the world than all other causes combined. Physical activity also improves concentration, self-esteem and school performance. Recognising the unique opportunity that exists to formulate and implement an effective strategy for substantially reduce deaths and disease burden worldwide by improving diet and promoting physical activity, WHO has adopted, in May 2004, the "Global Strategy on Diet, Physical Activity and Health". Reduce risk factors for chronic diseases that stem from unhealthy diets and physical inactivity through public health actions. Increase awareness and understanding of the influences of diet and physical activity on health an the positive impact of preventive interventions. Develop, strengthen and implement global, regional, national policies and action plans to improve diets and increase physical activity that are sustainable, comprehensive and actively engage all sectors. Monitor science and promote research on diet and physical activity. Since this document was released in 2004 WHO have continued to work hard to develop strategies and realistic goals world wide to improve the health of the population. WHO have acknowledged that NCD account for a large percentage of premature deaths, therefore in 2012, all countries committed to achieving a 25% reduction in premature mortality from non-communicable diseases (NCDs) by 2025 (the 25x25 target). This document is form the NCD Alliance on the 25x25 countdown. This article which will give you more information on the six risk factor. In 2018 the WHO launched a new WHO global action plan to promote physical activity (GAPPA). This plan responds to the requests by countries for updated guidance, and a framework of effective and feasible policy actions to increase physical activity at all levels. It also responds to requests for global leadership and stronger regional and national coordination, and the need for a whole-of-society response to achieve a paradigm shift in both supporting and valuing all people being regularly active, according to ability and across the life course. The action plan was developed through a worldwide consultation process involving governments and key stakeholders across multiple sectors including health, sports, transport, urban design, civil society, academia and the private sector. WHO developed the "Global Recommendations on Physical Activity for Health" with the overall aim of providing national and regional level policy makers with guidance on the dose-response relationship between the frequency, duration, intensity, type and total amount of physical activity needed for the prevention of NCDs. WHO Europe also recommends that regular physical activity, throughout the life course, enables people to live better and longer lives. This infographic summarises the opportunities of a "life course approach" to making physical activity part of every day life: for nations, communities, individuals and especially patients with long term health conditions. The UK Physical Activity Guidelines. Summary of Canadian Physical Activity Guidelines (adults 18-64 ys). Physiotherapists have always had a close relationship with exercise, the profession was founded on the work of remedial gymnasts and the profession has a rich history of prescribing rehabilitative exercise. Despite this, literature on physiotherapy as promoters of physical activity, is scant. The global physical inactivity crisis, and the epidemic of life-style related diseases (non-communicable diseases or NCDs) has created an urgent need to build on our rich history of prescribing exercise and develop our approaches for prescribing PA. Creating a more active population requires joined up thinking and action from many stakeholders; physiotherapists need to be active in engaging with individuals and communities. Physiotherapists have a lot to offer: access to people living with long term conditions, repeat consultations, exercise facilities, credibility with patients, injury or illness often creates "teachable moments", expert knowledge, and behaviour change skills to name a few. In the UK, all health care professionals are enabled to provide physical activity brief interventions within a framework for personalised care and population health, particularly in primary care. All UK health care organisations are also required to support health care professionals to make every contact count (MECC) for physical activity. These recommendations provide the remit for physiotherapists, (and all other health and social care professionals), to enable the WHO target of reducing physical inactivity by 10%, by 2025, a reality. Aweto (2013) Knowledge, attitude and practice of physiotherapists towards promotion of physically active lifestyles in patient management. Holm et al (2015) Does outpatient physical therapy with the aim of improving health-related physical fitness influence the level of physical activity in patients with long-term musculoskeletal conditions? Mulligan (2011) Promoting physical activity for people with neurological disability: perspectives and experiences of physiotherapists. ↑ Caspersen CJ, Powell KE, Christenson GM. Physical activity, exercise, and physical fitness: definitions and distinctions for health-related research. Public health reports. 1985 Mar;100(2):126. ↑ Kim J, Tanabe K, Yokoyama N, Zempo H, Kuno S. Objectively measured light-intensity lifestyle activity and sedentary time are independently associated with metabolic syndrome: a cross-sectional study of Japanese adults. International Journal of Behavioral Nutrition and Physical Activity. 2013 Dec;10(1):30. ↑ González K, Fuentes J, Márquez JL. Physical inactivity, sedentary behavior and chronic diseases. Korean journal of family medicine. 2017 May 1;38(3):111-5. ↑ Ericsson I, Cederberg M. Physical activity and school performance: a survey among students not qualified for upper secondary school. Physical Education and Sport Pedagogy. 2015 Jan 2;20(1):45-66. ↑ World Health Organization, World Health Organization. Management of Substance Abuse Unit. Global status report on alcohol and health, 2014. World Health Organization; 2014. ↑ World Health Organization. 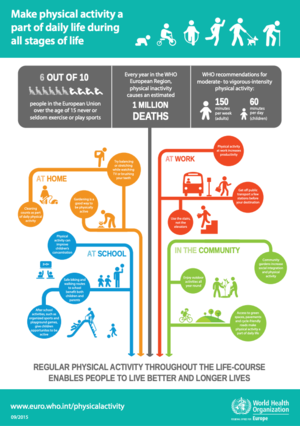 Global recommendations on physical activity for health. World Health Organization; 2010.